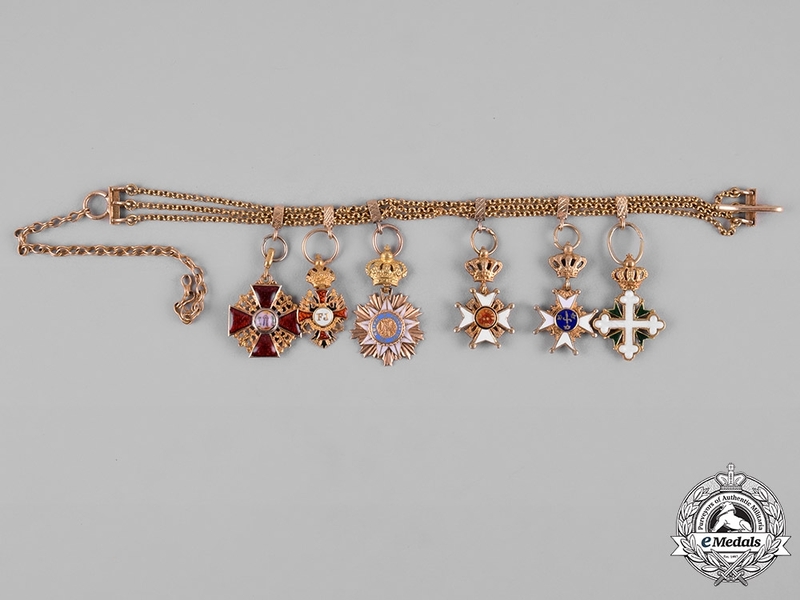 A fine period award chain with all Gold orders and decorations. 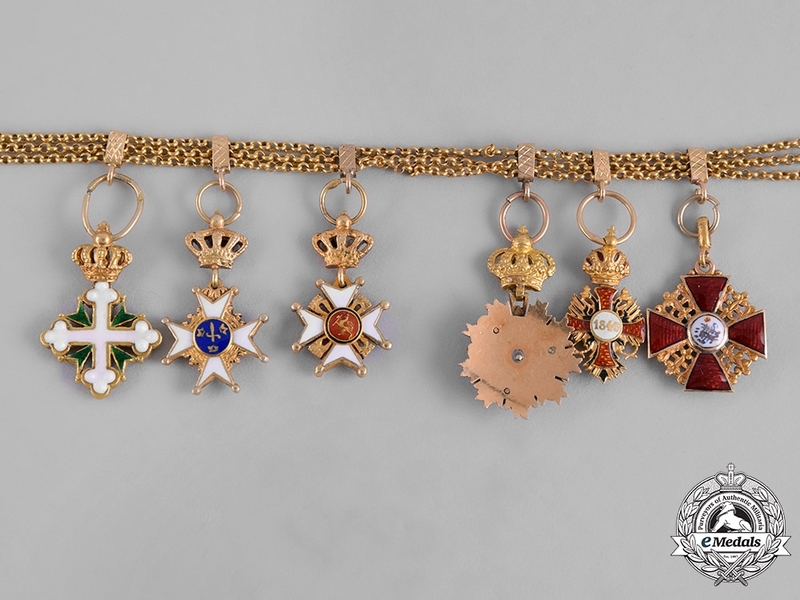 As originally worn consisting of the following: Russia, Imperial: Order of St. Anne (in Gold with red and white enamels, painted centrepieces, measuring 14 mm (w) x 16.5 mm (h) inclusive of its integral ring, replacement ring); Austria, Empire: Order of Franz Joseph (in Gold with red, white and black enamels, hallmarked with an eagle's head on the ring, measuring 9.8 mm (w) x 19 mm (h) inclusive of its crown suspension); Portugal, Kingdom: Order of Villa Vicosa (in Gold with light blue and white enamels, measuring 14.5 mm (w) x 23.5 mm (h) inclusive of its crown suspension); Norway, Kingdom: Order of St. Olaf, Type III (post 1937) (in Gold with red, white and blue enamels, measuring 11.8 mm (w) x 19.5 mm (h) inclusive of its crown suspension); Sweden, Kingdom: Order of the Sword (in Gold with blue and white enamels, measuring 12.5 mm (w) x 22 mm (h) inclusive of its crown suspension); and Italy, Kingdom: Order of St. Maurice and St. Lazarus (in Gold with green and white enamels, measuring 14.2 mm (w) x 20.7 mm (h) inclusive of its crown suspension). 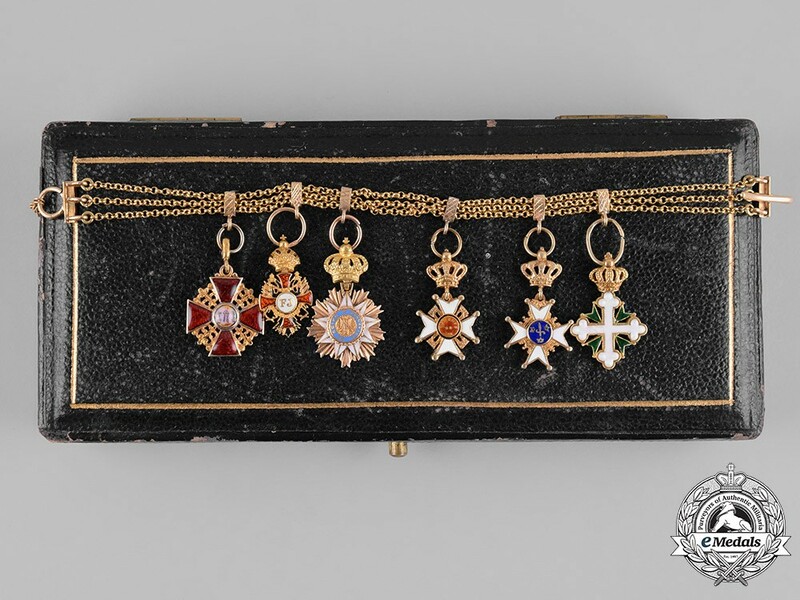 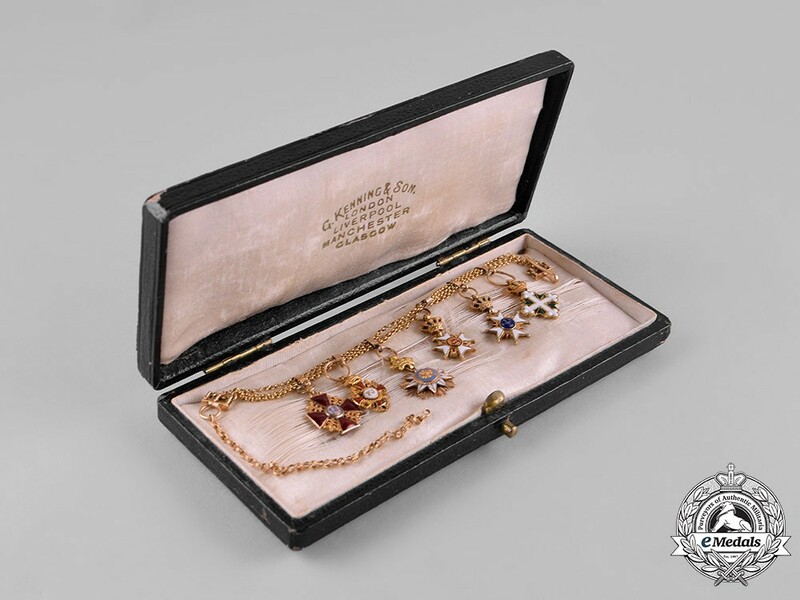 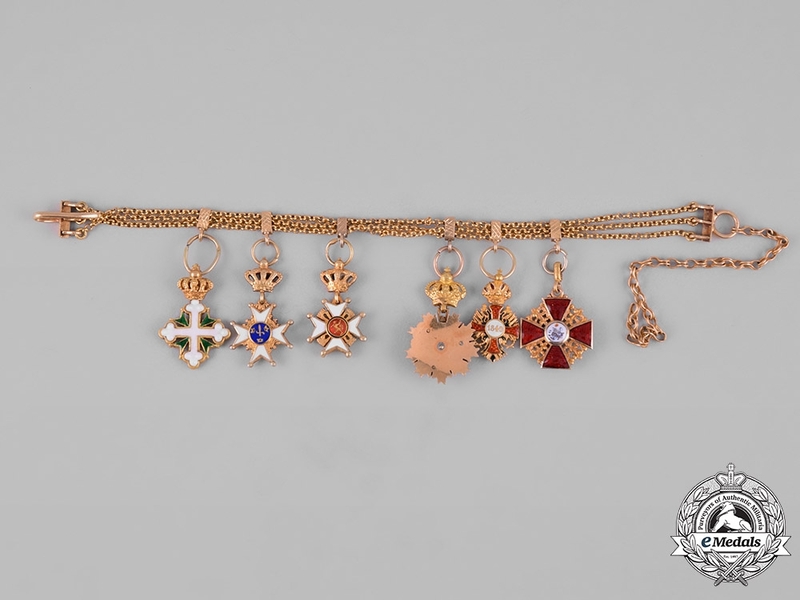 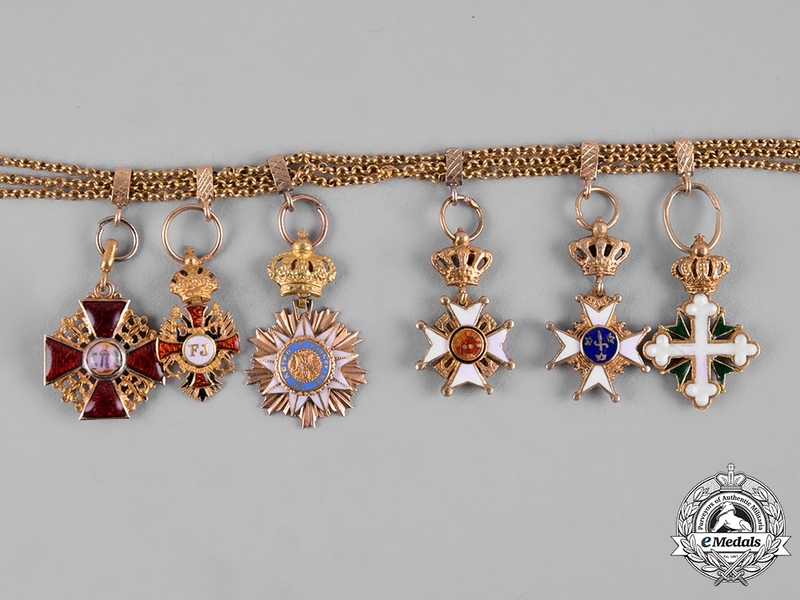 All sixawards are mounted to a Gold triple-strand chain with a hook at the far right end, collectively weighing 14.5 grams, intact enamels, extremely fine. 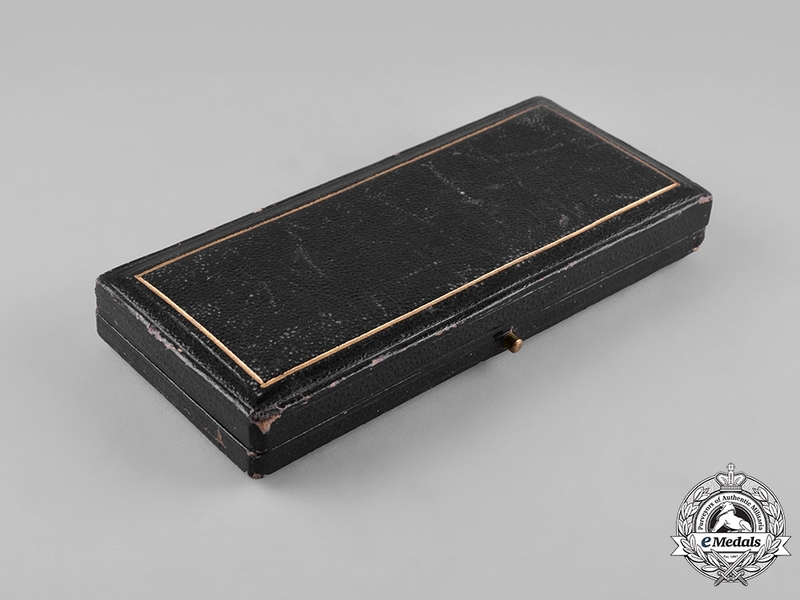 In a hardshelled case, maker marked "G. KENNING & SON. 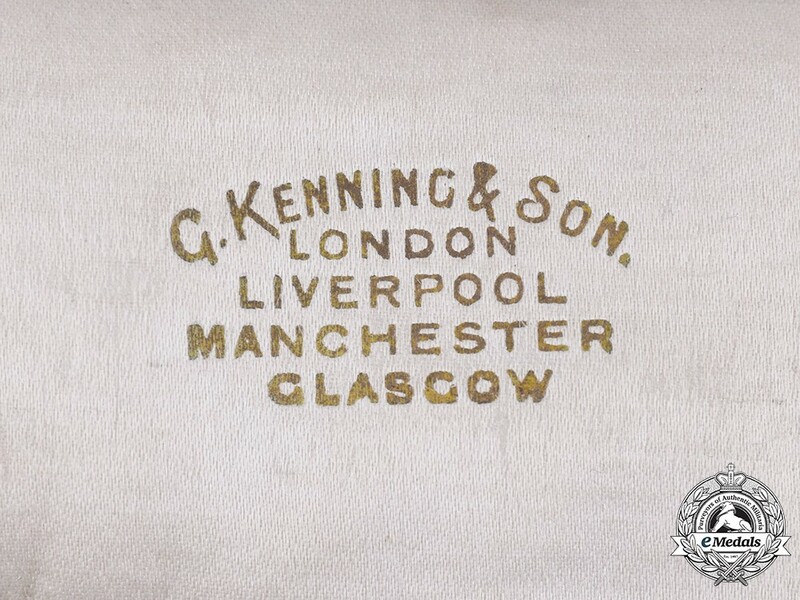 LONDON LIVERPOOL MANCHESTER GLASGOW" on the inside lid, the inside lid and medal bed lined in white satin, with light scuffing on the exterior, along with fraying evident in the medal bed, case very fine.